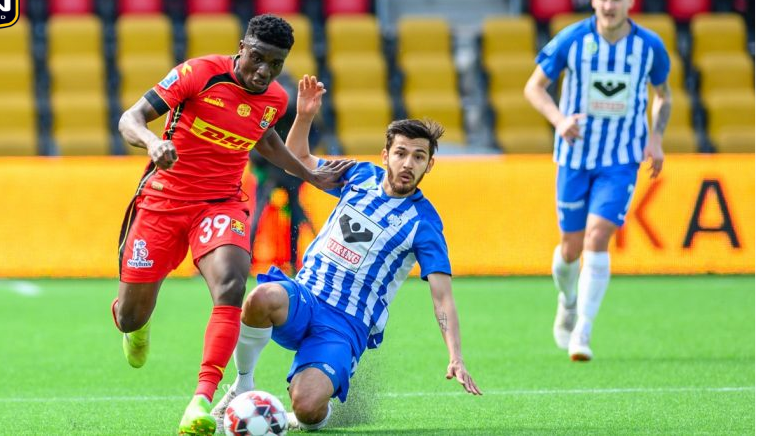 FC Nordsjælland midfielder Kudus Mohammed has expressed delight over his goal but was left disappointed with the defeat as Esbjerg rallied to pip them 2-1 in the Danish Superliga on Sunday. The Wild Tigers went into the match with the aim of bouncing back from their two-game winless run after two stalemates against Midtjylland and Brodby. Kudus Mohammed combined beautifully with Ulrik Yttergard to hand Flemming Pedersen's side the advantage in the 38th minute. But the lead did not last as Yuri Yakovenko pulled the visitors level four minutes later. Danish defender Carlo Holse silenced the Right to Dream Park with his 59th minute bullet header to give Esbjerg a 2-1 victory. "It was a fine goal, but it is difficult to enjoy right now when we have lost." "Esbjerg was well organized in the defense, and it was very difficult to find opportunities to break through. It was a pity that we did not hold onto when we were ahead, so they had been forced to move forward," Kudus says. The goal was Kudus' second in the league this term.